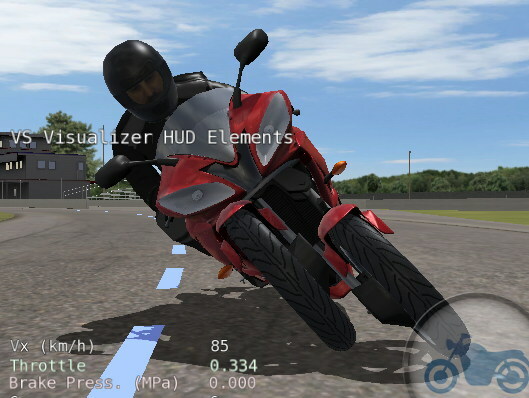 BikeSim is a software package for simulating and analyzing the behavior of two- and three-wheeled motorcycles and scooters in response to steering, braking, rider movement, and acceleration inputs. BikeSim runs faster than real-time using ordinary PC's. The basic BikeSim packages require no other software, although full compatibility with MATLAB/Simulink is included for users who want to extend the math model using Simulink. Additional packages offer extra capabilities. For information about system requirements and software compatibility, see this specification sheet. BikeSim includes a database with browser and GUI, engineering plotter, animator, and comprehensive motorcycle model. The vehicle models are provided as dynamically linked libraries (DLLs). The same DLL is used for stand-alone runs (the core vehicle model running with no external software), or with Simulink, or custom programs written in C. The DLL always runs at high speed, giving results much faster than real-time on typical PCs. Of course, identical behavior is obtained regardless of the simulation environment, because there is just one DLL used in different contexts. The basic package includes interfaces between the BikeSim DLL files and Simulink. All VS solvers fully support the VS command scripting language, for automation and model extension. They also support the VS API, providing access to the math models from external programs written in languages such as MATLAB, Visual BASIC, C/C++, Python, etc. All solvers support 200 programmable moving objects (traffic vehicles, crossing vehicles, pedestrians, etc.). Movement is controlled with VS commands or external software (e.g., Simulink). The sensor option provides up to 99 ADAS sensors. The sensors provide 22 variables for each detected object (range, range rate of change, bearing angles, elevation, magnitude, etc.). The detection variables are typically sent to Simulink for use in user-defined advanced driving assistance systems (ADAS) or other advanced controllers. The sensors have sensitivity to range, bearing, elevation, and reflectiveness. Targets can be rectangular or cylindrical. Occlusion (blocking of view) is supported, to simulated conditions where some objects block others, or when part of a large object (building, parked car, etc.) is partly outside the range of the sensor field. Input and output files from BikeSim RT can be exchanged with users of offline (Windows, non-RT) BikeSim. This lets you follow the same design and evaluation from preliminary design to HIL evaluation. BIkeSim includes three VS Solvers that handle most 2- and 3-wheeled motorcycles and scooters. Click for more detail.